We’re not sure why you might want to park your cars on your pool area, but you could. Do you have a heard of elephants that need a place to lounge? Ok, lets get more practical: how about a place to host a last-minute wedding reception when everything else in town is booked? No problem. You get the idea… All-in-all, it’s a solid cover that can be designed to look and feel like the rest of your floor. People enjoy watching how it “disappears” into the wall as your pool area transforms into a recreational space, party area, or nearly any other use. Unlike anything on the market, our covers are both load-bearing AND retractable. All products meet floor load limits of at least 100 pounds per square foot (at minimum, higher load limits available). All products are custom-designed to meet unique specifications. Our engineers can retrofit existing spaces or aid in the design process for new developments. Tight-fitting panels lock securely to produce a seamless floor. The only seams are along the very outer edges of the pool and are barely noticeable. May be implemented indoors or outdoors. Discreetly hides away through facility walls or floor. Designed for ease of use, dependability, and long-lasting value. Tested in over 11 years of development and design improvements. Can be insulated to promote energy savings and can be covered with many different types of floor coverings to match your decor / existing flooring. The cover deploys or retracts in less than 5 minutes with a turn of a key and stores above or below ground inside or outside your home. 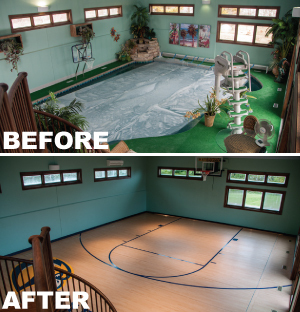 Your pool area will now be appraised as usable space, and will ADD value to the property. Converts from a solid, load-bearing usable surface to a pool and back again in minutes. In commercial applications, it presents an opportunity to generate new revenue. Reduced energy costs (keeps heat in or out, depending upon the season). Reduced chemical use and water loss due to evaporation. Ease of use – cover will retract with the touch of a button – no messy plastic covers to untangle. Increased facility longevity: The life of the structure will be extended because the typical “moisture damaged areas” will be reduced significantly. Saves water and Conserves energy: When closed, the covers virtually eliminates evaporation, meaning less water added to the pool. Heat loss is significantly reduced, meaning less fuel needed to heat the pool. Better yet, the room stays cooler and less humid since there is less water in the air. Because your pool essentially converts to a floor, there is no opportunity for drowning when closed. Nobody without a key and/or code can open or close the pool cover. Opening/Closing procedures include an automatic stop where the user is instructed to make one final inspection to ensure nobody is in the pool prior to closing. Opening/Closing procedure is an active and manual process to ensure proper monitoring. Your pool area can be completely secured in after hours without needing to have additional security measures. Far more secure than any alternative to restricting pool access (such as fences, locked doors and other pool covers). All WutGroup cover panels are currently manufactured with anodized extruded aluminum or stainless steel that span the width of the pool. The number of panels varies with every application. Panels vary in thickness depending on the span and load-bearing requirements. Covers made from lightweight aluminum extrusions are very strong yet remain lightweight and durable. WutGroup can design a WutPool cover to meet most load requirements. 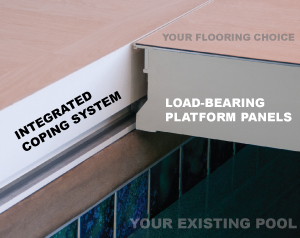 Our patented roller track system allows custom-manufactured, heavy-duty, load-bearing panels to move easily above your pool and lock firmly into place. The panels are automatically stacked and racked by using automated robotic systems. All processes are controlled by a computer, which can be accessed remotely. WutGroup covers are available for many other commercial and residential applications of most any size. WutGroup covers take space utilization to the max with long-lasting value that far exceeds the purchase price. Learn more on our Applications page. Our spa size covers typically range from $50,000 – $140,000. Our pool size covers typically range from $150,000 – $500,000. Our Manual spa size covers start around $25,000. Our Manual pool size covers Start around $110,000.00. We look forward to the opportunity to provide you with a quote for your cover. However, do to the level of interest in our products and the time invested in the “discovery” process, we request that all inquiries be serious and qualified. In order to provide you with a rough estimate, we will need pool measurements and surrounding information for the indoor/outdoor area. These needs include: blue prints (with specific measurements of deck, distance to walls, photos, drawings, etc.). The initial estimates will get us on the same page, and we will then go to more detail from there. Part of the early development process includes engineering design fees. We deal in both retrofit or new construction, and each cover is custom made as each install is unique (ex: rectangular vs. irregular-shaped pools). Our state-of-the-art, WutPool cover is designed and manufactured exclusively for your specific use by our subsidiary company, WutGroup, LLC. WutPool covers are designed for ease of use, dependability, and long-lasting value. Contact WutGroup to obtain information relating to any load-bearing cover need.